Firefox 20 has all the goodies and it is already available for stable Ubuntu releases such as Ubuntu 12.10 and Ubuntu 12.04. But what about Ubuntu 13.04? Ubuntu "Raring Ringtail" is already on beta and the final release will happen in a few weeks time. And it is yet to receive Firefox 20 update. It will be coming anyways before the final release. But if you are like me and want the latest and greatest of Firefox right now, here's what you need to do. What's so special about Firefox 20 anyway? 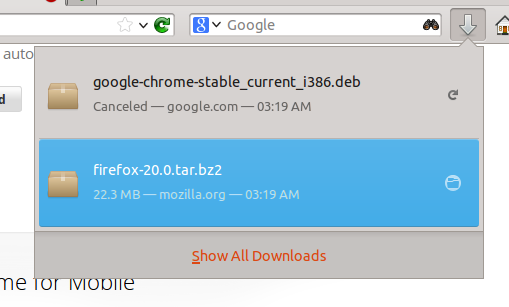 Firefox finally has a download manager that can take on the competition head on. It is well integrated into the browser itself and when clicked, it will show three most recent downloads with an option to show all downloads in a different window. During downloads, the arrow icon changes into a timer bar that estimates the time left in your download. Once your download is finished, the arrow icon turns blue and remains so until you've clicked on it to review your downloads. Very nice and clean approach to a common problem don't you think? Those goes two of the most common complaints people had about Firefox. Your choice of eco-system alone matters now. I am going to give Firefox another try for sure. How to Upgrade to Latest Firefox 21 in Ubuntu 13.04? 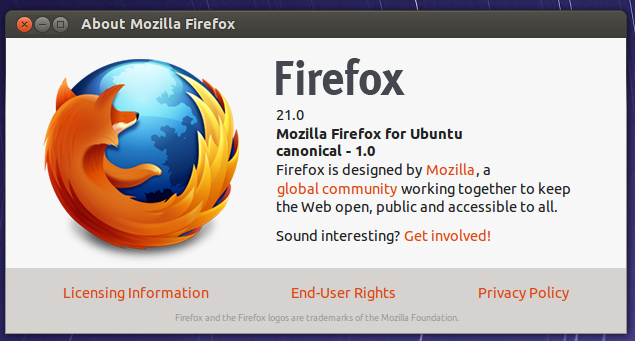 A quick heads up: Official Firefox 20 update is going to arrive in Ubuntu 13.04 very soon. Follow the instructions only if you want to try latest Firefox right now. The following PPA will upgrade your Firefox to version 21. Do the following in Terminal (while in Ubuntu 13.04). Done. Your Ubuntu 13.04 will now be running Firefox 21 instead of Firefox 19.x. What's new in Ubuntu 13.04 "Raring Ringtail"?